Sydney's Fashion Diary: Holiday Sales Season Begins (50% off or more)! Holiday Sales Season Begins (50% off or more)! If you've been following my blog, you know I am truly a bargain hunter. Holiday sales have already started online and at brick-and-mortar stores. I am happy to share a few great sales that are happening right now. LOFT - $35 and under event. Click here for a complete list of items that are $35.00 and under. Nothing to get too excited about. If you're looking for some basic pieces, it is worth checking out. I have these 2 items on hold for me to try on in store. Talbot's - Buy 3 items and get 50% off (with code ADORN – shoes and accessories only). Thanks, Elle! I am not interested in their clothes but love their shoes. I ordered 3 pairs of shoes to try on today. If you spend $100 or more, you also get free shipping. Based on my experience, their shoes are very well-made. The ones that I previously ordered fit true to size. I really hope they’ll work out. 1. Light-weight corduroy leggings: I am wearing a 24/00 in this picture. The rust color is beautiful. However, the material is thin and they didn't fit me very well. They are $23.00 after discount. 3. This skirt is my favorite of the bunch (I couldn't find it online). The smallest size I could find in store was a 2 (hence, it looks enormous on me). It is a great fall/winter staple for those who is in the lookout for one. 4. Marbled cable knit vest: It was a tad big on me but might work under a thicker tee. Great sale roundup! Omigosh, you got those burnt orange platform penny loafers. I think they look so chic and rustic, but I don't know what color tights I'd have to wear them with. Can't wait to see these shoes on you. i love your Talbots picks, Sydney!! and i actually really like those rust jeggings on you -- if only they were still available online! I got the tan and gray booties but not sure I'll keep:) I'm excited to see the caged pumps on u!!!! Oh!! Excited to see how your new shoes fit! I hope they all work out! These sales are all so tempting!! Is the Gap 60% off in-store only? Thanks. @Anonymous Sorry, I should have mentioned that this offer is for cardmembers (and in-store) only. If you are a Gap cardmember, you should have received this flyer in the mail. My Gap cord is one of my favorite pants nowadays and I reach for it every week. I bought both this rust color and the wine color, and found that the wine color is much less wrinkly than the rust color. did you try the wine color in store? The price is unbeatable. Have a great weekend, Sydney. I just got that bib necklace Sydney, during the friends and family sale! At first I thought $36 was pricey for Loft, but I bought it anyway! It is absolutely gorgeous, I did see it sold out online! These are great selections! Super cute picks. 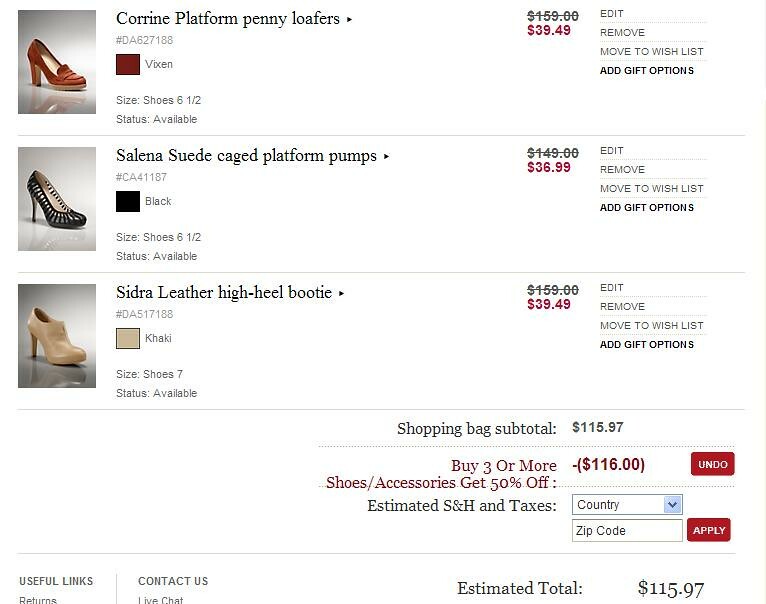 I have been obsessively checking the Talbots site for those Sidra booties. They're out of my size,total bummer! Amrita Singh is having a really great Black Friday sale in case you're interested. They're having 50% off the entire store! Use the code BLACK11!